Membrane separation processes have gained tremendous advancements in the recent past and continue to surge ahead as a frontier technology in the field of water purification. Nanotechnology, on the other hand, is increasingly being identified as an area of science and technology that could play a role in addressing some of the short-comings of conventional POU devices. Studies suggest that nanotechnology-based materials could lead to cheaper, more durable, and more efficient water treatment technologies that meet the needs of developing countries. Several water treatment methods and devices that incorporate nanoscale materials are being developed. However, it is realized that a well defined and well engineered nano-based POU water purification device for household should come into force to take care of safe-water needs of all sections of our society. Bhabha Atomic Research Centre is extensively involved in development and deployment of desalination, water purification and water recycle technologies for providing safe drinking water to the masses. BARC has developed a methodology to produce a domestic water purification device which is made of polysulfone based nanocomposite ultrafiltration membrane in cylindrical configuration. 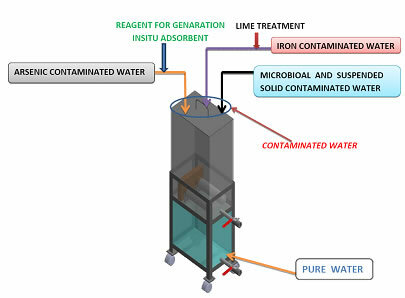 This configuration/point-of-use device stand alone can be effective for removal of microbial contaminations and decontamination of arsenic and iron in the states like West Bengal, Chhatisgarh, Bihar, Jharkhand, North Eastern states etc through chemical addition without the need of any electricity and overhead water tank, and hence can be used even in slums and rural areas of the country. The device with two candles can provide 20 Liter per Day of potable water and the contamination level is reduced below the permissible limits as specified by IS 10500 for drinking water standard. This is very simple, well-engineered, single, reliable and cost effective point-of-use device. Product water free from arsenic, iron and microorganisms. The process is suitable for treatment of ground/surface water in the states like West Bengal, Chhatisgarh, Bihar, Jharkhand, North Eastern states etc. where water is severely contaminated with arsenic and iron and hence not fit for drinking. It is also suitable for removal of microbial contamination to the desirable limits at domestic level without the need of any electricity and overhead water tank and hence can be used even in slums and rural areas of the country. The present technology describes a methodology to produce a domestic water purification device which is made of polysulfone based nanocomposite ultrafiltration membrane in cylindrical configuration. This configuration/device can be effective for removal of microbial contaminations, arsenic and iron without the need of any electricity and overhead water tank. All the raw materials required are available in the local market. It does not require any special specified facility, except a membrane casting room with control temperature (23 ± 2 °C) and relative humidity (< 40 %). The development of arsenic and iron removal kit requires a small laboratory with few common equipments like weighing balances, exhaust and common glasswares. One Chemist and two skilled workers would be adequate for the purpose.